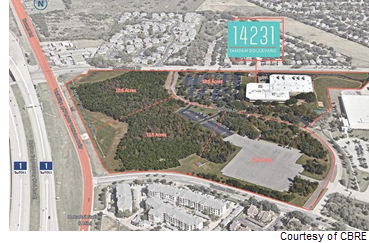 ​​​​ AUSTIN – CBRE has been named to market a 52-acre campus in North Austin. The location at 14231 Tandem Blvd. is a 186,000 sf office/lab/server building with frontage on MoPac Expy. About a quarter of the property is under short-term leases. The property will be marketed for a corporate campus or mixed-use development. “In addition to the developable land sites, another 35,250 sf of rentable office space can be added to the building” said John Alvarado, CBRE senior vice president.